Set on a 'Viking Dig' archaeological site, the Jorvik Viking Centre is a fascinating exploration of the Viking presence in York over 1,000 years ago. Between 1976 and 1981, the York Archaeological Trust excavated thousands of Viking-era objects, including wooden houses, alleyways and fence lines, all part of the ancient centre of Viking power in England, Jorvik. Shortly after, the centre opened its doors and swiftly became a popular tourist attraction in the city. With over 800 items on display, this 'living history site' presents informative exhibits, reconstructions of the excavated Viking village (including authentic smells and sounds!) 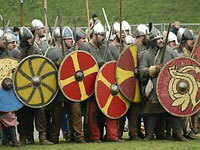 and costumed 'Viking' guides, offering visitors the chance to experience what life was like in 975 AD. A highly popular event is the annual Jorvik Viking Festival in February, when Vikings roam the streets of York once more. Enjoy weaponry displays, hands-on activities (including shield-building and excavating), re-enactments of Viking boat burials, guided walks, an evening of ancient tales and songs, and much more.